Currently, my life is being comprised of the ultimate emotion smoothie (is that disgusting or a cool analogy? It can be both, I guess) of excitement, apprehension, sadness, relief, joy… and baked goods. I channeled all of those feelings into a pie. Well. Sort of a pie. You know how I mentioned in an earlier post about my lack of finesse? Pies are the true representation of that. I can’t deal with crust and making it pretty and delightful, so I embrace the “rustic” look. You can pretty much pile a bunch of dusty crap on a table, call it rustic and anticipate 1000 repins. Such is my pie. And honestly, this particular pie wasn’t THAT good. 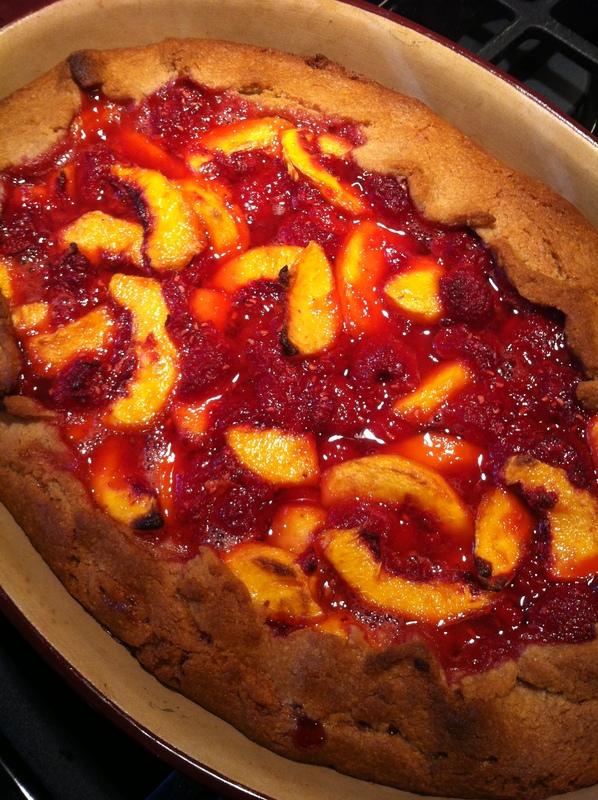 I learned an important lesson – peaches and raspberries just don’t play well together in a dish (they’re like the Rachel McAdams-Ryan Gosling of the produce world… they’re so pretty and should be soul mates, but, fate has other plans). But, the graham pastry crust, and the very very high potential for something incredible with a quick berry switch, make it worth a post. The next few days are going to be my favorite and least favorite as my mom tries to teach me to relax after roughly 5 years of maintaining a maximum threshold of adrenaline. I loaded up on some books, magazines, and most importantly, wine, for a quiet beach getaway before jumping in to a new season that should allow for more time in the kitchen and more time just BEING. Cream butter and sugars in a stand mixer (or by hand). Add honey and mix until smooth. Slowly add half of graham cracker crumbs and half of flour. Once combined add the other half along with the salt and cinnamon. Dough should be thick and almost crumbly. Combine dough in a ball, chill for 30-60 minutes. Remove from refrigerator and place it on lightly floured (or graham cracker crumbed) surface. Roll out to size of pie dish with overage for folding. Prepare fruit filling by adding peach slices and berries in a small bowl. Squeeze in lemon juice, add sugar. Mix and let sit for 5-10 minutes until fruit begins to release juice. Add filling to pie dish, and fold dough “overage” over edges of filling. Bake at 375 for 20 minutes and 325 for 25 more minutes.